So how does the log book loan top up work? In order to get a top up logbook loan, you'll need to have taken out a logbook loan with Car Cash Point already. If you have, you'll know all the ins and outs and the benefits that come with it. If you haven't yet applied, keep reading for how to get your funds in under an hour. However, if you think you need some additional funds for something as you come to the end of your existing loan, you may well be eligible to renew or top up your log book loan with us. While we'll always look at this for our customers, your top up could depend on a couple of things. We always try to help our customers with a log book loan right from your very first application. So a successful top-up could be based on whether you've kept up to date with your current repayments for an acceptable length of time. If you have, you might well have become one of our long-term, dependable and trustworthy customers. Making sure of that will always work in your favour of course. But for a successful top up loan with Car Cash Point, we might need to see that you're still able to afford and make your new repayments. In effect, a top-up will be a new loan, so, much like your original loan with us, we'll look at repayment terms that suit your own financial circumstances. If you are a long-standing and reliable customer, you could be in a great position to top up and continue in taking advantage of one of the best value log book loans in the UK. Before you can take out a top up logbook loan with us, of course, you'll need to have an original logbook loan through Car Cash Point. Taking out a loan with us is really simple and only really relies on a few factors, with the main one being that you own your car outright and it's free of any finance. Car Cash Point can give you a fast and simple loan based on the value of your car and help you withdraw the cash easily, allowing you the money you need when you need it. With a straightforward application, our award-winning customer service team will take you through the entire process, giving you the time to understand how everything works. We pride ourselves on using plain English, so we always explain the process to you in full, without any jargon. Many log book loan lenders won't take the time to do this and will hide important information in their small print. By doing that, you could find unexpected costs being added to your account. At Car Cash Point, we have no hidden charges, so you know in advance exactly what you'll be paying back. You should never use any lender that makes their money from unexplained hidden fees and charges. Car Cash Point are one of the UK's leading log book loan lenders and we have a great, fixed low-interest rate. Some lenders have a rate that's almost double, so it's clear right from the start that you're getting a great deal. And another area that we pride ourselves on is that we're the only UK logbook loan lender that does not require a formal credit check. By taking a log book loan with Car Cash Point, your loan will remain private. No one else needs to know as we don't require any guarantors and your application won't appear on your credit file. Having a bad or low credit score can work against many people and leaves them unable to borrow at all, so by not needing credit checks, Car Cash Point should still be able to help you. We also recognise that people have different jobs that pay in different ways. That's why we're the only UK lender that offers you flexible terms of weekly, fortnightly, four-weekly or monthly repayments that genuinely suit your own incomings and outgoings. Because we offer this, you should never have to accept a repayment term from a lender that will put you in financial difficulty. When you're looking at your logbook loan, you should really consider all the options available to you and choose a lender you can trust, as well as one that puts your interests first, rather than their own. 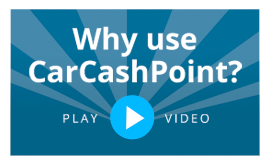 At Car Cash Point, we believe that we do that and our thousands of satisfied customers would agree. So whether you're looking to get a top up logbook loan or are a first-time borrower, call one of our expert advisors today on 0333 220 4419 and let them guide you through the process. They'll call you straight back and arrange for one of our specialist reps to visit you, check the details of your car and finalise your paperwork. Alternatively, apply here and fill in our 30-second application form on the page. You could have your loan money in your bank account within just one hour!